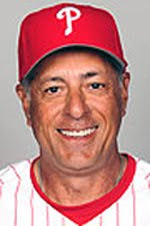 With the Philadelphia Phillies looking to repeat as World Series Champs, PBI President and Founder Doug Cinnella spoke with Phillies 3rd base coach and longtime PBI Advisor Sam Perlozzo on prepping for the World Series, the importance of good defensive and offensive fundamentals, working with Phillies manager Charlie Manuel, and Sam’s relationship with PBI. Click on each link to hear the audio. Segment 1 – Doug and Sam talk about prepping for the World Series. Segment 2 – Doug and Sam talk about defense, including Ryan Howard’s improvement this year and some of the great infielders Sam has worked with over the course of his career. Segment 3 – Doug and Sam talk about hitting, and doing drills from Little League through the Major Leagues. Segment 4 – Doug and Sam discuss Sam’s coaching future, working with Phillies manager Charlie Manuel, and coaching 3rd base at the MLB level. Segment 5 – Doug and Sam talk about Sam’s role as a PBI advisor. Special thanks to WDHA for their assistance in producing these interview segments.